Annalee Doll Description: Last one. 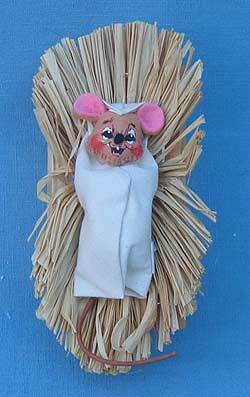 Open eyes, open mouth - as shown, wrapped in a muslin blanket, a wooden cradle with hay. Manger. Companions are 544203, 544303, 544503, 544603 and 544703. 4 3/4" long (wood to wood-not including the straw) and 3" high to the nose of Baby Jesus and 3" wide.